The White-necked Heron is a large heron with a white head and a long white neck with a double line of black spots running down the front. The upperparts of the body are slate-black, with plum-coloured nuptial plumes on the back and breast during the breeding season. Underparts are grey streaked with white. The bill is black, the naked facial skin is is blue or yellow, the eyes are green, and the legs and feet are black. The Heron eats fish, frogs, insects and reptiles in local ponds. White-necked Herons feed by wading in shallow water or stalking through wet grass looking for fish, amphibians, crustaceans and insects. Farm dams and irrigation and drainage ditches provide feeding habitat for White-necked Herons. The Jacky Winter is a small grey-brown flycatcher with a faint pale eye-line and white underbody. The dark tail has prominent white outer feathers which are obvious when it lands, wagging his tail from side to side. The Jacky Winter typically sits upright on a bare branch or perch, wagging its tail and uttering its 'peter-peter' call. There are three sub-species, with slight geographical variation, darker in the south and paler in the far north and inland. 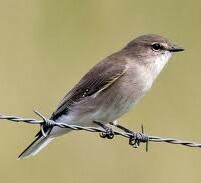 This species is also known as the Brown Flycatcher, Postboy, White-tail or Peter-Peter. The Darter is a large, slim water bird with a long snake-like neck, sharp pointed bill, and long, rounded tail. Male birds are dark brownish black with glossy black upperwings, streaked and spotted white, silver-grey and brown. 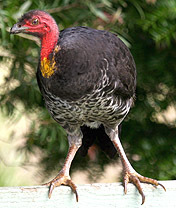 The strongly kinked neck has a white or pale brown stripe from the bill to where the neck kinks and the breast is chestnut brown. Females and immatures are grey-brown above, pale grey to white below, with a white neck stripe that is less distinct in young birds. 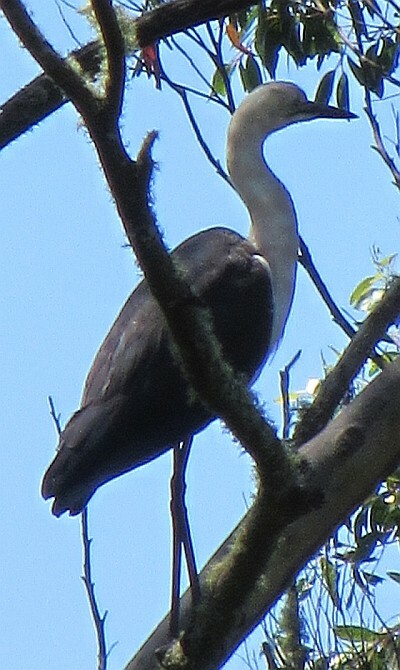 The Darter is often seen swimming with only the snake-like neck visible above the water, or drying its wings while perched on a tree or stump over water. They take fish from local ponds. The Darter catches fish with its sharp bill partly open while diving in water deeper than 60 cm. The fish is pierced from underneath, flicked onto the water's surface and then swallowed head first. Smaller items are eaten underwater and large items may be carried to a convenient perch and then swallowed. Insects and other aquatic animals, including tortoises, may also be eaten, as well as some vegetable matter. 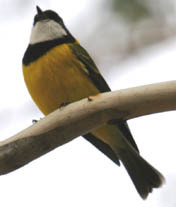 The adult male Golden Whistler is bright yellow on the underside, olive-green on the back and wings, and black on the head with a bright yellow collar. The throat is white, separated from the yellow chest by a broad black band. The bill and legs are black. Females lack bright plumage. They are generally grey above, with a pale olive tinge, and paler grey below, with a buff wash. The bill is dark brown and the legs grey-brown. The eye is red-brown in adults of both sexes. Young Golden Whistlers are rufous. As they mature, the plumage comes to resemble that of the female other than rufous edges to some wing feathers. These are later replaced as the bird matures. 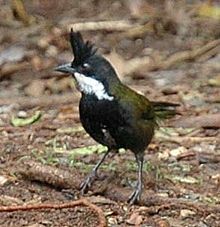 Adult Eastern Whipbirds are mostly dark olive-green above, with a long tail, and a grey-white belly. 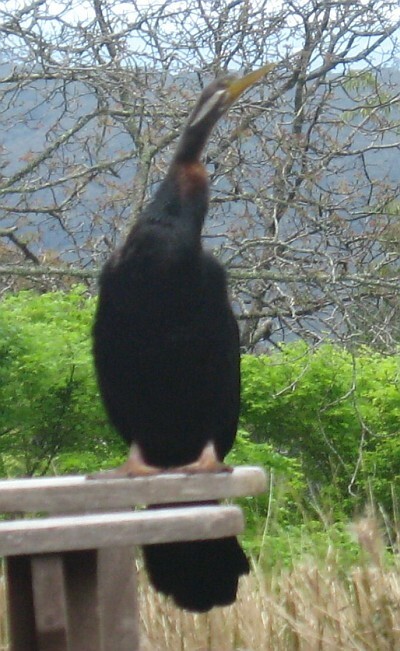 The head and breast are black, with a broad white patch on the side of the face and a black crest. The eye is pale cream and the bill is black. Young whip birds are generally duller, with a smaller crest. The white cheek patch is absent in very young birds, and increases in size as the birds mature. 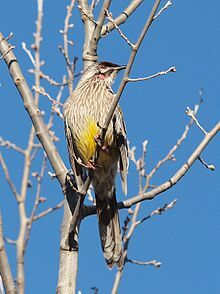 The Red Wattlebird is a large, noisy honeyeater. The common name refers to the fleshy reddish wattle on the side of the neck. The plumage is grey-brown on the body, with prominent white streaks and yellow on the belly. The face is pale and the tail is long with a white-tip. 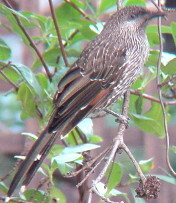 Young Red Wattlebirds are duller than the adult and have a brown, rather than reddish, eye. The wattle is also very small and pale. 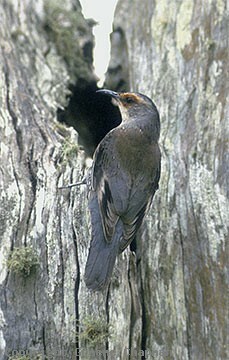 The Little Wattlebird is a medium to large honeyeater, but is the smallest of the wattlebirds. It is mostly dark grey-brown above, with faint white shafts on each of the feathers. The underparts are grey and are heavily streaked with white. The streaks are finer around the throat, becoming more blotched on the sides of the belly. In flight, there is a large rufous patch in the wings. The eye is blue-grey. The sexes are similar. Young Little Wattlebirds resemble the adults, but are duller, have less streaking and a have a browner eye. The Red-browed Treecreeper (Climacteris erythrops) is a species of bird in the Climacteridae family. It is endemic to Australia. Its natural habitats are subtropical or tropical moist lowland forests and subtropical or tropical moist montane forests.